I read in a book recently that no child should go to bed hungry. That is a 100 percent issue. The book said nobody can disagree on a 100 percent issue without looking foolish. It said to champion a 100 percent issue and conquer it. If you do, Christ will find a way to work through you. Harper said this is his way of sharing Christ. 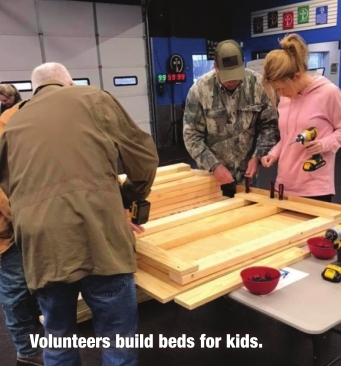 He oversees Sleep In Heavenly Peace, a non-profit that partners with organizations, churches and businesses to hold Build Days during which beds are built from scratch to last a lifetime. No woodworking experience is needed. At one build, he said he had a 10-year-old up to a 70-year-old. Volunteers are supervised, and tools are supplied on Build Day. Employees or organizations network and build relationships while doing volunteer work, Harper said. Volunteers may go on the deliveries. Recently, seven ladies delivered to five sisters – twins at age 4 and their 5-, 6- and 7-year-old siblings. Once an application is received, a selection committee will review it. Selecting a recipient isn’t done on a first-come, firstserved basis, but based on which children need beds the most, Harper said. The cost of a bed is $175. The organization or business must raise the amount for a minimum of 10 beds to participate. One hundred percent of donations go toward Sleep in Heavenly Peace. Lowe’s provides a discount on building costs, and Johnson’s Furniture has trimmed prices for mattresses. Future builds are at Citizens National Bank on Highway 80 on Good Friday and Vicki’s Dance, where 60 high school girls will volunteer. A bunco group has contributed, and a build has been held at Christ Fit Gym. Mary Queen of Peace Catholic Church is using its Ash Wednesday collection for a contribution. Harper was watching Mike Rowe’s “Returning the Favor” when it featured Sleep in Heavenly Peace a year ago when his “eyes starting leaking a little bit” and his wife walked into the room, and he told her he wanted to do this project. Enough money was raised for him to get training to begin. In a year, Harper said 52 beds have been made and 38 delivered. The other other 14 are awaiting mattresses and linens. There are 78 people on the waiting list.